When you are filing your taxes, it is important not to make any mistakes. Mistakes result in your tax refund being delayed and no one wants that. Therefore, today this article will discuss common tax filing mistakes to help decrease your chances of having your tax refund delayed. E filing your return will help you reduce math errors and it helps you get your refund back faster too. When you paper file and actually write in the numbers and do the calculations yourself you are more likely to make an error. 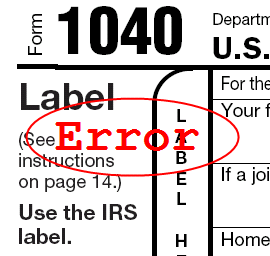 Math errors happen to be the number one tax filing mistake that taxpayers make each year. Misspelled names are another error that the IRS sees all too often when they review tax returns. Misspelling a name results in a delayed refund, therefore, before submitting your return you need to double check everything to make sure it is spelled the way that it should be. You may have checked your return to insure that everything is as it should be. However, many taxpayers forget to make sure that their direct deposit information is correct. If you put down the wrong bank account numbers, your refund is going to be delayed because you were to excited to check one of the most important things needed for you to be paid. Entering the wrong filing status is another common error made on tax returns. Before selecting a filing status, analyze who is covered under it to insure that it is the ideal filing status for you. These are the common errors that are made. However, the goal is to make sure that you do not have any errors when filing your tax return. Therefore, you have to make sure you check everything thoroughly before submitting it. Be sure to visit our Seattle CPA site!